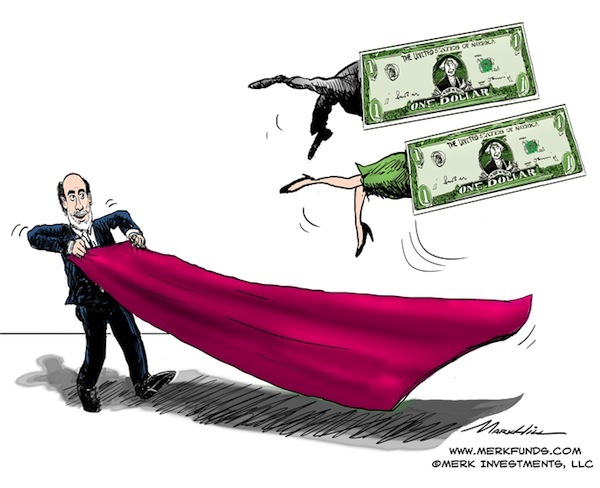 Merk Insights - Fed to Debase Dollar? Is the Fed’s goal to debase the U.S. dollar? The Federal Reserve’s announcement of a third round of quantitative easing (QE3) might have been the worst kept secret, yet the dollar plunged upon the announcement. Here we share our analysis on what makes the FOMC tick, to allow investors to position themselves for what may be ahead. We have heard policy makers justify bailouts and monetary activism because, as we are told, these are no ordinary times: extraordinary times require extraordinary measures. Acronyms are needed, as we are told that things are complicated. We respectfully disagree. It’s quite simple: we have had a credit driven boom; we have had a credit bust; and Fed Chairman Bernanke thinks monetary policy can fix it. Merk Senior Economic Adviser and former St. Louis Fed President William Poole points us to the fact that the Soviet Union, Cuba and North Korea have one thing in common: monetary policy could not have compensated for the shortcomings of the respective regimes. The successor nations to the Soviet Union, as well as China had economic booms because they opened up, not because of printing presses being deployed. Monetary policy affects nominal price levels, not structural deficiencies. In the U.S., the economy may be held back because of uncertainty over future taxes (the “fiscal cliff”) and regulation; monetary policy cannot fix these. But the above experiences have something else in common: they refer to lessons of recent decades. Bernanke, in contrast, is a student of the Great Depression, the 1930s. Bernanke firmly believes that tightening monetary policy too early during the Great Depression was a grave mistake, prolonging the Depression. Never mind that there had been major policy blunders by the Roosevelt administration that might have been driving factors; Bernanke’s research squarely focuses on how history would have evolved differently had his prescription for monetary policy been implemented. The reason why Bernanke thinks tightening too early after a credit bust is a grave mistake is because a credit bust unleashes deflationary market forces. Left untamed, a deflationary spiral may ensue driving many otherwise healthy businesses into bankruptcy. Nowadays, we hear “it’s a liquidity, not a solvency crisis.” With easy money, the Fed can stem the tide. Whenever the Fed has the upper hand, the glass is half full, “risk is on” as traders like to say; but then it appears that not quite enough money has been printed and, alas, the glass is half empty, “risk is off.” The high correlation across asset classes is, in our assessment, a direct result of the heavy involvement of policy makers. Sure, markets may move up when money is printed; the trouble is everything moves up in tandem, making it ever more difficult to find diversification, so that on the way down, investors find protection. It’s for that reason, by the way, that we focus on currencies: why bother taking on the noise of the equity markets if investors buy or sell securities merely because they try to front-run the next perceived intervention of policy makers? In our assessment, the currency markets are a great place to take a position on the “mania” of policy makers. Note that if one does not employ leverage, currencies are historically less risky than equities. So we know Bernanke wants low interest rates. But there’s more to it: as we saw earlier this year, a string of good economic indicators sent the bond market into a nosedive. Treasuries were bailed out by subsequent mediocre economic news, allowing bond prices to recover. The challenge here, in our assessment of Bernanke’s thinking, is that the bond market can do the tightening for you. When Bernanke bragged in his Jackson Hole speech in late August that a well-behaved bond market is proof that his policies are well received, we had a more somber interpretation: the reason the bond market is well behaved is because the economy is in the doldrums. Let all the money that has been printed “stick”, i.e. let this economy kick into high gear. Sure, Bernanke says he can raise rates in 15 minutes (he can pay interest on deposits at the Fed), but given the leverage in the economy, any tightening that comes too early might undo all the “progress” that has been achieved so far. Differently said – and we are putting words into Bernanke’s mouth here – Bernanke has to err on the side of inflation. But how do you err on the side of inflation, without the bond market throwing a fit? A central banker is most unlikely to ever call for higher inflation. You do it with “communication strategy”, a commitment to keeping interest rates low; you do it with quantitative easing, i.e. buying Mortgage-Backed and Treasury securities; you do it with Operation Twist, depressing yields by buying longer dated Treasury securities. But, “when inflation is already low…” as Bernanke stated in his 2002 “Helicopter Ben” speech, “the central bank should act more preemptively and more aggressively than usual.” How do you do that? First, you create an open-ended buying program, so that the market cannot price in all easing within moments of the announcements. And more importantly, you break the link between monetary policy and inflation. Bernanke wants to make sure investors realize that policy is now tied to a “substantial improvement in the labor market” rather than its inflation target. It’s only then that the Fed can go all out on promoting growth without having the bond market sell off. Does it work? Judging from the initial market reaction, no. Bond prices have fallen, inflation expectations as expressed in the spreads between inflation protected Treasury securities (TIPS) and underlying Treasuries have shot higher. It might be because the dust from the Fed’s bombshell hasn’t settled; or it might be that the Fed hasn’t had time to intervene in the market by buying TIPS (while not extensively, the Fed has been buying TIPS on occasion) depressing inflation indicators. Either way, however, many observers have wondered whether lowering interest rates a tad further is really the panacea the economy needs. Part of it is that mortgage rates aren’t falling at this stage, if for no other reason than banks have such dramatic backlogs, that they have little incentive to open the floodgates even more for further refinancing activity. But even without such backlogs, how many more projects are worth financing with the 10-year bond trading at 1.6% versus 1.8%? Interest rates are low, no matter how one slices it. That leaves one other interpretation open. Don’t take our word for it, but read the 2002 Helicopter Ben speech: “Although a policy of intervening to affect the exchange value of the dollar is nowhere on the horizon today [in 2002], it's worth noting that there have been times when exchange rate policy has been an effective weapon against deflation.” The argument here is that a lower dollar boosts exports and thus the economy. Ignored is the fact that Vietnam might try to compete on price, but an advanced economy should work hard to compete on value added. As such, we are only providing a dis-incentive to invest in competitiveness if the Fed’s printing press provides the illusion of competitiveness. We use the term printing press because it is Bernanke in the aforementioned 2002 speech that refers to the Fed’s buying of securities (QEn) as the electronic equivalent of the printing press. So don’t let anyone fool you. Things are not complicated. In our assessment, the Fed may be out to debase the dollar. Investors may want to get rid of the textbook notion of a risk-free asset, as the purchasing power of the U.S. dollar may increasingly be at risk. There is no risk-free alternative, but investors may want to consider a managed basket of currencies including gold, akin to how some central banks manage their reserves, as a way to mitigate the risk that the Fed is getting what we think it is bargaining for.